Since the world of tablets is getting bigger, better and more versatile, many of us (iPad aficionados and those who are now becoming ones) ask a question: Can I run Outlook on the Ipad? Well.. it would be a Sci-Fi question, if it wasn’t for VMware View, thanks to which you can have Outlook displayed in the iPad or iPad 2 totally for free. 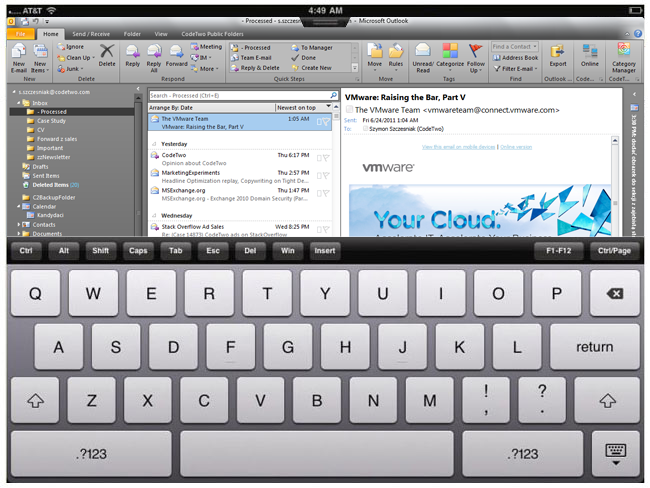 VMware has finally made it possible to access your Windows Desktop from the iPad, which means you can not only display your favorite mail client there, but also use your tablet as a remote client of your desktop machine. If you don’t want to use any remote desktop connections and want to simply synchronize your iPad with Outlook, you can do it pretty easily with the iCloud service and its iCloud Control Panel for Windows, which allows you to share Outlook data with iPad automatically. The iCloud-Outlook synchronization is, however, a little bit tricky as upon installing the control panel you get a new tree of folders in Outlook with your iCloud data. This has little to do with syncing as your master folders are still left intact. You can luckily fix this thanks to CodeTwo Sync for iCloud. Learn more about CodeTwo Sync for iCloud and download it. I have similar issues as those presented above. But add multiple folders and sub-folders in Office 365 on my PC to the mix. I cannot see any of these folders on my Apple devices. And yes, I was told by Apple to go talk to Microsoft and vice versa. Microsoft’s Level 2 support has worked on the issue for several hours and left me with a bigger mess than before. They seem to have tried phoning me to carry on, supposedly from an even higher level. Unfortunately their phone systems do not like mine. Thus I get these calls, but when I answer I get no response. Very, very frustrating. I wanted to buy a MacBook recently to supplement, rather than replace, my Dell Inspiron PC. But Apple sent me home with the advice to sort out my email issues before adding a new device. We all lose in the process. Might it be time to create similar standards, voluntarily I hope, by cooperation of the major players, rather than by government(s) interference? The new version is free for all license owners. To install the update, run the new setup file (http://www.codetwo.com/sync-for-icloud/download/?sts=2379) on top of you current version of the program. I’ve used CodeTwo Sync for iCloud to keep my iOS and Outlook contacts in (two-way) sync. It works very well for this purpose. Unfortunately there are issues with the syncing of one’s Outlook calendar and an iOS calendar. When I select a one-way sync from Outlook to my iOS calendar I wind up getting duplicates- both in my iOS and my Outlook calendar files. Instead of simply sending my Outlook events to my iCloud calendar, CodeTwo Sync for iCloud creates these events in my iCloud calendar but then they are duplicated and these duplicated events are present in both my primary Outlook calendar and the selected iCloud calendar. Would appreciate any advice on how to overcome this issue. Apple hates MS and MS hates Apple. Now how cornfuzing is that! That is exactly why we have developed CodeTwo Sync for iCloud. For multiple machines you can also use CodeTwo Public Folders. I can’t believe that Apple and Microsoft have not worked out a fix for the synchronsition between outlook and the iCal / Contacts etc. How hard can it be. I have been discussing this for 3 weeks with apple who don’t seem TO KNOW about the problem and then they said “its a Microsoft Problem” and guess what – MS say its an Apple problem because its not synching with iPhone. We’ve been looking for a viable business reason to get rid of some iPhones and 26 iPads . Apple broke the sync and that is the reason. We run windows and Outlook in the office.